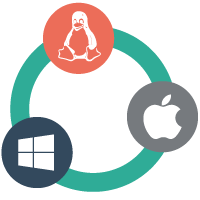 Visual Paradigm is a cross-platform tool which can be installed in any Java-enabled operation system including Windows, Mac OS and Linux with unified look & feel and user experience. Download just one installer for each of these OS platform for free 30 days full featured Enterprise Edition evaluation and import the key if you have purchased a license without the need of re-installation. Visual Paradigm seamlessly integrates with leading IDE including Eclipse, NetBeans, Visual Studio, IntelliJ and Andriod Studios. Once you installed Visual Paradigm, you can activate the IDE integration and corresponding plugins without any other installation needed.